Use the Income Estimator on tdameritrade.com to learn about stocks that have historically paid dividends. Have you ever wondered how modifying your mix of dividend stocks and exchange-traded funds (ETFs) might affect your income over the next 12 months? Or maybe you’re brand new to dividend stocks and want to see how adding them to your portfolio could boost your income? 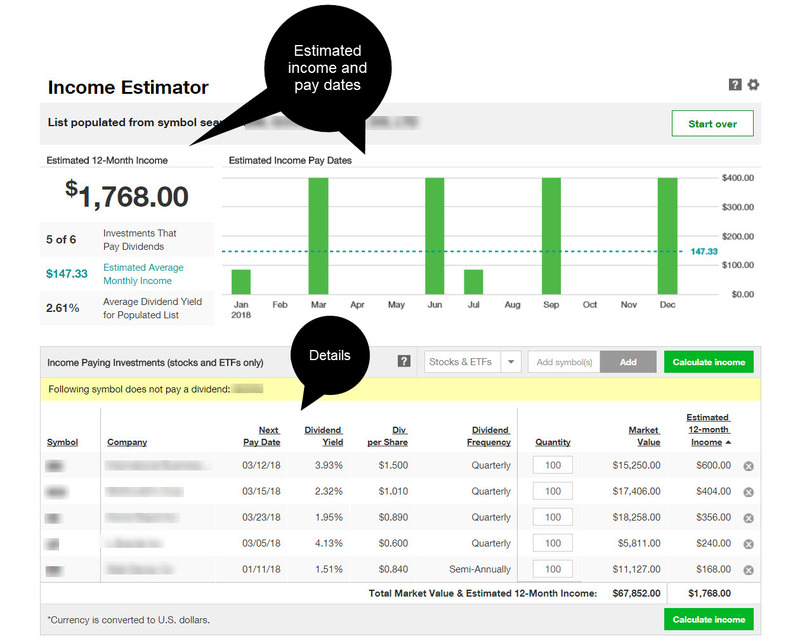 The new Income Estimator tool from TD Ameritrade can help you find the answers you’re looking for. A dividend is a portion of a company’s earnings, distributed to shareholders in the form of cash or stock. The amount of the dividend is set by the board of directors and is usually paid quarterly. Dividends are typically paid by companies that have a long history of profitability, so you don’t see as many IPOs or high-growth stocks with dividends. The tool also lets you look back at a company’s historical dividend payments to see if there’s a trend—whether positive or negative—in dividend growth. 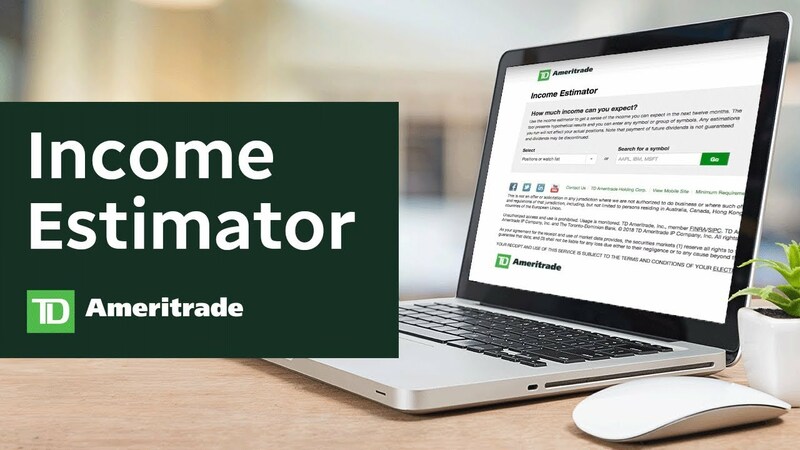 To access the estimator, view a stock or ETF profile by entering its symbol in the quote box on the home page of your TD Ameritrade account. Once on the profile page, click the “Income Estimator” link located just above the tabbed data options, at the right (figure 1). FIGURE 1: Income Estimator on tdameritrade.com. To use the tool, log in to your account at tdameritrade.com, type in a symbol, and click Income Estimator. For illustrative purposes only. Past performance does not guarantee future results. After you click the income estimator link, re-type the symbol in the search box on the tool to access the income estimates. You now have the option to either pull in additional individual stocks or even one of your previously created watchlists. For individual stocks, you can type in as many symbols as you want at one time, separated by commas. After clicking “Go,” you’ll see the estimated 12-month income for the stock(s) you entered in bold in the left-hand corner, as well as a chart showing the estimated date and amount of the individual payments (see figure 2). Dividend data is updated every morning, so the estimates stay current. Have one or more of your stocks not paid a dividend recently? You’ll see a yellow indicator ribbon. Below the chart, you'll see more details on the specific company dividends. The tool automatically defaults to 100 shares per holding, but you can modify the quantity to fit your portfolio or estimated allocations. You can use the “Add” button to add stocks to the mix, or click the small “X” at the far right of a stock’s line item to remove it from the estimator. FIGURE 2: Using the Income Estimator tool. See estimated income, dividend yield, and other data. For illustrative purposes only. Past performance does not guarantee future results. Once you have your list set, use the dropdown menu to toggle between the “Stocks & ETFs” view, or to view them each separately. One nice feature for those new to dividend investing is the “Finding Dividend Paying Stocks” section at the lower right-hand side of the estimator. By clicking the predefined “High Dividend Yield” screen, you’ll see a list of those stocks with the highest dividend-to-price ratio. This list can be sorted by column headings, and you can save individual stocks to your own personal watchlist by clicking the check boxes next to each and then selecting “Add to watch list” at the bottom of the page. 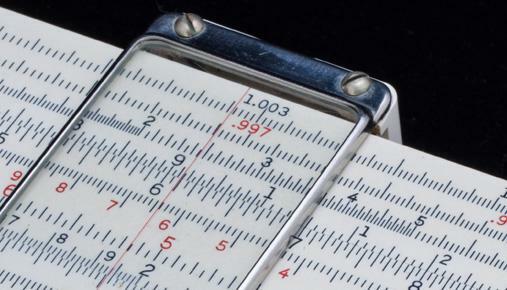 The Income Estimator is a highly flexible and easy-to-use tool that can give you powerful insights into how dividends can work within your portfolio. Whether you’re a dividend pro or new to the game, try the Income Estimator out and see what it can do for your investment planning. You may be searching for yield, but you're not alone. 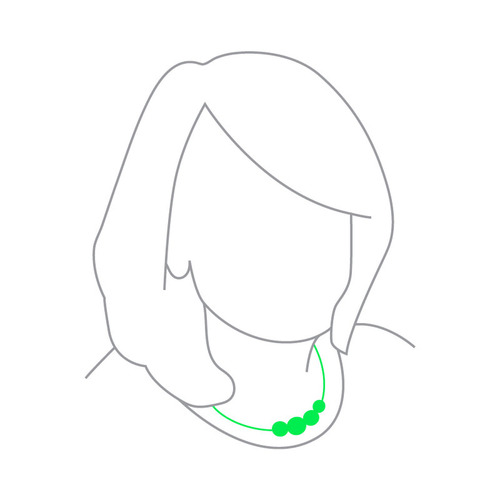 TD Ameritrade has tools intended to help do some of the heavy lifting for you. Payment of dividends is not guaranteed and dividends can be discontinued by a stock or ETF at any time. All investments involve risks including loss of principal.